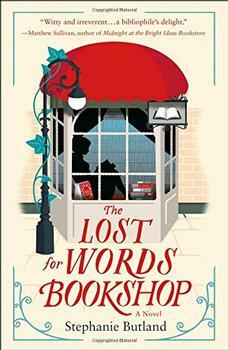 It's the oldest bookshop in a town full of bookshops; rambling and disordered, full of treasures if you look hard. Jude found one of the treasures when she visited last summer, the high point of a miserable vacation. Now, in the depths of winter, when she has to run away, Lowell's chaotic bookshop in that backwater of a town is the safe place she runs to. Jude needs a bolt-hole; Lowell needs an assistant and, when an affordable rental is thrown in too, life begins to look up. The gravedigger's cottage isn't perfect for a woman alone but at least she has quiet neighbors. Quiet, but not silent. The long dead and the books they left behind both have tales to tell and the dusty rooms of the bookshop are not the haven they seem to be. Lowell's past and Jude's present are a dangerous cocktail of secrets and lies and someone is coming to light the taper that could destroy everything. When Jude crossed the road and tried the handle, she half expected to find Lowland Glen locked too and was ready to sit in the bus shelter, then retrace her journey to Newton Stewart, Castle Douglas, Dumfries, with a night in one of the tired hotels clinging on in a tired town, then a train south and the tube home to face the music. There were one or two more carrier bags stacked in the passageway, but otherwise nothing had changed. Well, the light was differentno sunshine competing with the lamp behind the curtainand there was Calor Gas as well as tobacco and dust in the bouquet today as she pulled aside the heavy brocade and stepped through. Also, this time, the man was at his desk, sitting with the fawn cardigan around his shoulders and a cup of greyish coffee steaming. Because the novel is classified as suspense, readers will need to be careful not to become discouraged with its pace. The climax builds very slowly, but the last few chapters bring several surprises and answers to tidbits that seemed irrelevant at first mention. The ending is swift, and although the book takes a while to gain momentum, readers should stick it out. While Quiet Neighbors does have some quirks, it is an engaging read that most will find worth their time and effort. (Reviewed by Mollie Smith Waters). Starred Review. McPherson's literary observations are delightful, her quirky collection of characters intriguing, and the unfolding mystery highly satisfying. Starred Review. Although softer-edged and less terrifying than most of McPherson's stand-alones, the slow unraveling of several deeply puzzling circumstances and the complex characters provide a fine read. Quiet Neighbors drew me in from the very first page, and I stayed up late reading it because I couldn't wait to find out what happened next. That's the definition of a good book. with over a quarter of a million books to choose from, old and new."